Ray Mead (1921 – 1998). A prominent member of the Painters 11, Mead was well known for his works in black and white and yet, as exhibition curator Stephen Smart maintains “Mead was also an exceptional colourist.” Although Mead’s work came to prominence in the 50s and 60s, Smart’s selections give evidence of a growing maturity in the artist’s work in the last decade of his life. This exhibition brings together canvases, works on paper and drawings dating from 1985 – 96, a period that was prolific for Mead. Though many of these works have never been exhibited, they are a compelling testament to a Master Canadian painter dedicated to Abstraction. Born in 1921 in Watford in Hertfordshire England, Mead studied art at the Slade School until 1939 when he joined the Royal Air Force to train as a fighter pilot at the start of WW II. In 1941, he was posted to Hamilton and traveled to the United States often. He was exposed therefore, to American culture and the New York art scene. It was a time that dramatically impacted Mead’s mind set and brought a new freedom. The decision to remain in Hamilton changed the course of his art career. It was there that he met Hortense Gordon, an artist who had trained with Hans Hoffmann. 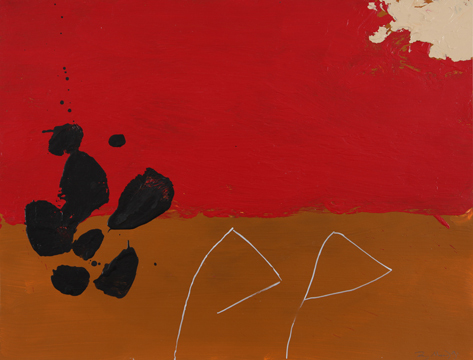 Gordon became an important mentor for Mead and further supported his movement into abstraction. Ray Mead had his first public showing at the Art Gallery of Hamilton in 1948 and his second at the Art Gallery of Toronto in 1950. He joined the Ontario Society of Artist’s and showed in their 1950 exhibition, which was a brave foray into the world of abstraction. Mead continued to show with the OSA and established close relationships with several artists who would later join to form the Painters 11. Seven of these, including Mead, showed in the infamous Simpson’s show, “Abstracts at Home” in 1953. Over the next decade Mead was included in fifteen Painters 11 Exhibitions including a New York show at the Riverside Museum in 1956. Mead’s work was included in shows at the National Gallery of Canada in 1956, 1972 and 1992. In addition from the 1950s until his death in 1998, Mead had many solo, two person and group exhibitions throughout Canada. His work is included in numerous collections including the National Gallery of Canada and the Art Gallery of Ontario. Reception generously supported by Treasury Wine Estates.